Share the post "Unusual Uses Of Honey"
Simply use one part honey to ten parts water (you can also add some cane juice so as not to overpower the flavour of the fruit), add it to a jar with the berries of your choice (raspberries and blackberries are best). 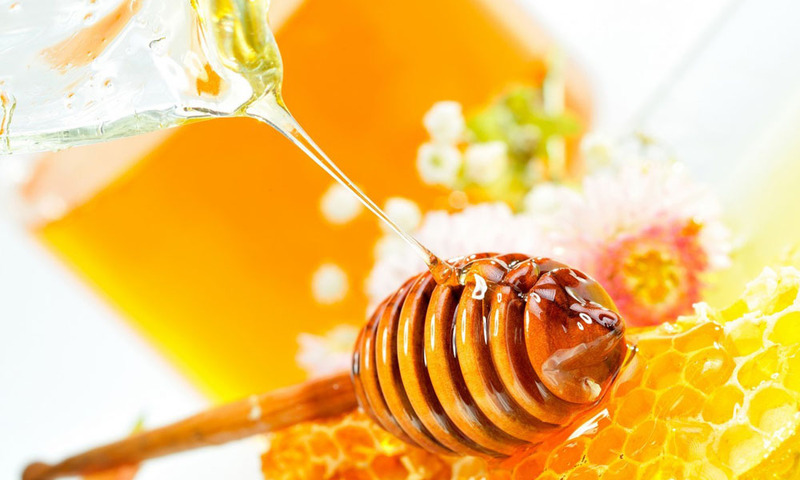 Honey is “a natural humectant with antimicrobial properties”. To help give your face the glow, you can use a simple honey wash by mixing one spoonful of honey into two tablespoons of warm water and slowly massage the mixture into your skin. If you want to step it up a bit, you can make a cucumber, honey and milk facial mask by gently blending some cucumber (don’t purée it), then add it to the milk, honey and brown sugar mixture. Massage the lotion all over your face, leave it for half an hour then wash it off. Honey reputedly increases fertility. Raw honey may be particularly helpful as it’s an alkali-producing food. Eat one teaspoon of honey three times a day. Honey is reputed to help. Jasmin, marjoram, and orchid honeys are especially favoured. Consume one teaspoon of honey three times a day. Add some honey to your toast; to a cup of tea; or just eat it straight out of the jar. The fructose will help metabolize the alcohol in your system. Honey also aids recovery by providing sodium, potassium, and vitamin B6. Consume one tablespoon of honey after drinking alcohol. – Contains Vitamin B and acetylcholine. – Promotes thee production of melatonin (a hormone that helps record long-term memories). Pepole who have honey before bedtime report increased dream intensity and recall. – Discourages low blood glucose and therefore the production of cortisol which can diminish short-term memory. Substitute honey for sugar. Consume a teaspoon of honey within the hour before bedtime. Honey reputedly slows hair loss. Once or twice a week, massage two tablespoons of warmed runny honey into your scalp. Wait 30 minutes, then shampoo. This is a weird one. We all get dry skin from time to time, but the skin around our joints is exceptionally finicky when it comes to moisture. Once you’ve washed and scrubbed your skin (exfoliating helps), just apply some honey to your dry elbows, let it sit for around half an hour, and then wash it off! Ever had cracked lips? Well, you can make a simple lip balm from honey, beeswax and almond oil. The oil and the wax help it all stay together, and the honey gives it some flavour. This is most definitely a better option than all those chemicals you’re putting all over your mouth. Mix two teaspoons of thick honey with two teaspoons of extra-virgin olive oil and one drop of frankincense, lemin or neroli essential oil. Massage this mixture into your cuticles, leave for 20 minutes, then rinse. Been traveling to a different part of the world and brought some unwanted friends back with you? Honey can help! Blend honey, vinegar and water and drink it as soon as you’re aware you have parasites. Apparently the acidity in the vinegar and the therapeutic elements in the honey are enough to expel any bodily intruders. But anyway most definitely see a doctor. Honey can potentially play a key role in your fitness regime, but it must be treated like any other part of your diet. If it meets your calorie allowance, then sure, use it to replace sugar and other sweeteners. A drink of warm water and honey before bed can help ease hunger, burn fat and stop those nasty sugar cravings. Honey also helps speed up your metabolism, allowing you to process food and nutrients faster. But anyway please consult your physician/dietician/nutritionist before changing your diet. Take some honey and boil it in a saucepan until it’s of a liquid consistency. Grab a jar, pop in the herbs (like lavender or pot pourri) and pour in the honey. Use about one tablespoon of herbs for every eight ounces of honey. Cap the jar tightly, and let it marinate for around a week. Once it has soaked in properly, add one tablespoon of the honey and herb mixture to an eight-ounce bottle of unscented lotion and you’re ready. An alternative honey moisturizer recipe that doesn’t involve blending with regular lotion is just as simple. Mix four tablespoons of honey with a couple of egg whites and a few tablespoons of flour (adjust to achieve your desired consistency), and you’ve got yourself a hand and body lotion that can also be used as a face mask. Once you’ve run the water, add a few tablespoons of honey (adjust to your liking) to give you a sweeter smelling, extra relaxing and softer bathing experience. Honey is reputed to help prevent childhood bedwetting. Do you know other unusual uses of honey? Please share in the comments below! Safety notes: This website is not intended as medical advice, and please check with your doctor before using all natural remedies if you are pregnant, using medications or have other health conditions.